Hi, I’m Megan Wilson and I’m a lecturer in the Department of Anatomy at the University of Otago, Dunedin, New Zealand. My research focus, and my scientific passion, is developmental biology. In this new regular blog on the Node, I hope to bring NZ developmental biology to the rest of the world. The NZ developmental biology community is vibrant and diverse, and overlaps with a range of other disciplines, from medical research to evolution and ecology. It wasn’t always the case, though. As a Biochemistry undergrad, and then a PhD student at Otago in the late 1990s, there were very few options for studying developmental biology. My interest in developmental biology came from wanting to know more about the genetic disorder my brother had, Tuberous Sclerosis Complex (TSC). TSC affects multiple organ systems, but particularly the kidney, brain and skin, causing benign tumors to grow. I wondered why these tumors occurred in only a few organs and why symptoms varied so much between individuals. In order to really understand the origin of this disorder, I had to learn a little developmental biology, became fascinated by it, and this sparked a career shift. After a postdoc with Prof Peter Koopman in the Institute for Molecular Bioscience in Brisbane, I returned to Otago to work as a Research Fellow with A/Prof Peter Dearden in Biochemistry, before establishing my own lab in the Anatomy Department at Otago in 2010. 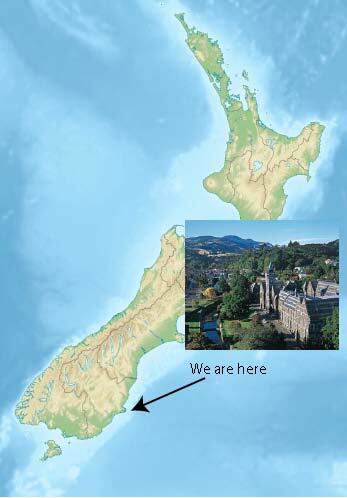 Otago University is located in the lower half of the South Island in Dunedin, New Zealand. It was the first University in New Zealand (founded in 1869) and now boasts a student population of over 20,000 and teaching/research campuses in Wellington and Christchurch as well as Dunedin. It is very much a ‘research-led’ institution with most teaching academics also running active research groups. Developmental biology at Otago is by nature multidisciplinary and multidepartmental – researchers from the departments of Anatomy, Biochemistry, Medicine, Zoology and Pathlogy contribute to teaching popular 3rd and 4th year courses on development. At Otago there has a been a steady growth in developmental biology research over the past 10-15 years, to the point where today there are more than 10 independent research labs at Otago University, including my own http://wilsonlab.otago.ac.nz. Developmental biology research at Otago covers a full range of animal and plant systems including mammals, insects, amphibians, urochordates, Arabidopsis and humans. Why post about NZ developmental biology research? Well, while NZ is a wonderful place to live and we have all the tools and talent to perform cutting-edge research, it’s true that we are very very far from everyone else. To get to a conference in the US or Europe, requires up to 36 hours in a plane (or more often many planes) and several thousand dollars in travel funds. As a result, many of us only get to one international meeting a year, and very rarely to smaller more focused meetings. This makes it very difficult to network, set up new collaborations or present our science to a wider audience. So the next best thing is to make use of social media such as blogging to share with everyone some of the exciting work being carried out in New Zealand, which is what I hope to do here. So in coming posts here at the Node I will profile some of the leading researchers at Otago and elsewhere in New Zealand. I will also provide meeting reports from local conferences from this side of the world. If you have any thoughts or comments, email me on meganj.wilson@otago.ac.nz.